Today is a pretty stellar day. Today My Canada (National) Student Loan Has Been Paid Off! Okay, so all of my online payments haven't gone through yet, so according to nslcs it's not paid off - but as far as I'm concerned it is. The balance this morning was $472.97. My regular $75 payment is due today and I transfered an additional $397.97 first thing. So, my new balance will be $0. My pay is only this big because I had an extra 37.50 hours of banked time paid out. I'm currently planning on putting $400 towards my Christmas Fund and $400 on my visa (to pay off palm springs). I believe that my horse board will go down to $90 in May, 2010 but I'll be confirming that tonight. I was planning on writing this brilliant post about my garden. I was going to take before and after pictures share about where my plants have come from and why they are sustainable. Last weekend when I bought the plants it snowed....then it was nice for a few days and there was hope. Yesterday, my city at a Winter Storm Warning - and this morning the world is covered in fluffy white stuff. So, this lovely spring post about my garden has been put on hold for a slight while. On a positive note, I received my pay stub (pay day's tomorrow) and I'm really looking forward to posting my bi-weekly budget. I had a weeks worth of overtime paid out - so I'm about to make some big headway on two goals! I'm still feeling great from our purge and re-organize this past weekend. I've loved sitting in the living room drinking my coffee with the morning news on. Just by setting the coffee maker on delay to brew a fresh pot for 6:45am I'm saving upwards of $600/year ($3.00/coffee * 5 days a week * about 40 weeks). That's not too shabby. What small ways do you save money every day? When I got home on Friday Jordan and already completely cleaned our bedroom! He had laundry started and was vacuuming! It was pretty great. Well, that got us started on a huge Sunday clean and re-organization of the house. Sunday, we woke up and had our coffee. I looked around the living room and sort of had this i'm fed up moment. Fed up with the dust on the baseboard and the crumbs between the couch cushions. First, i started at the front door. I cleaned out the closet, dusted the table by the door and mopped the floor. When I was done, I realized that Jordan had grabbed a broom and started sweeping. Before long, we had dusted, swept and mopped the whole living room - after which Jordan and I decided to complete re-arrange it. We didn't stop there either - while Jordan did the stairs I did the downstairs bathroom. Then we both tackled the kitchen and dining room - which also got re-arranged. We started at about noon and didn't stop cleaning and organizing until 7:30pm. It was a loooong day. How often do you do a huge clean up? Do your house mates (be them roommates, boyfriends, girlfriends, spouses, parents or siblings) help? So I suppose you can tell that there's not a lot going on this week with my lack of posting and all, but there are a few odds and ends that I can share. My Aunt gave us a chain saw to cut up some firewood we have (giant wood that needs to be sawed before axed) however; it doesn't work right. My dad had a look at in and figures it needs a new diaphragm (a piece in the carburetor). So, yesterday I bought a carb kit and fuel filter. That combined with chainsaw oil and a five gallon jerry can cost about $45 - I thought it would be way more, so pretty pleased about that. I requested to have 37.50 hours of banked time paid out on my April 30, 2010 pay yesterday - and then I'll get the remaining 15 hours paid out on my following pay if I need the $ for anything. The extra week of hours should pay off the rest of my Canada Student Loan (sitting at about $400 right now) and put a big dent in my Christmas Funds. 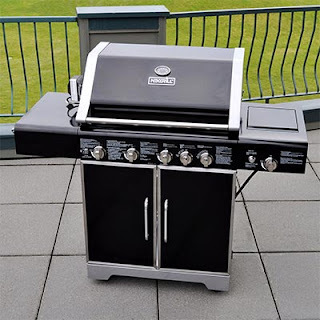 ...and Jordan and I bought a new BBQ. We've been saving for this on the side for a while now and finally found one that would meet our needs! It cost about $400 after taxes from Costco. The online price is a bit higher ($550) - my mom says that's because of shipping. 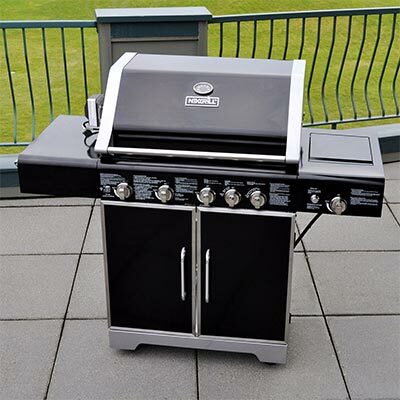 We've roasted hot dogs and grilled steaks - and so far - she's cookin' fine! so, today is kind of a big day. why is today a big day you ask? 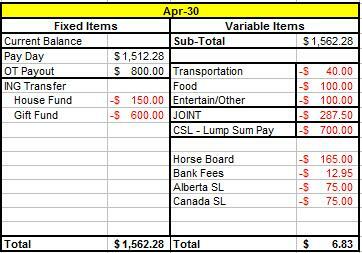 I think the rest of my bi-weekly budget is pretty self explanatory - not a lot going on. 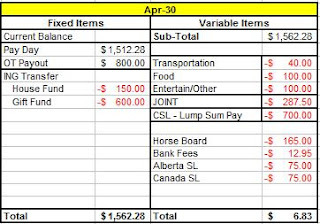 Further to my post last week about the eventual demise of my Alberta Student Loan, I have changed my repayment plan on my loan. I was going to just do extra payments through onilne transfers but, after thinking about it some, I thought that was too easy to not do. Effective May 14, 2010 my default payment will be $300 bi-weekly. From the spreadsheet below, I will just have to make one extra payment of about $15.00 to have my loan paid off before Christmas, 2010. So, I'm pretty excited about that and pumped that I won't be able to cop out. ...in the Vancouver International Airport. I've contacted the lost and found and as of about 2pm on Tuesday afternoon, it hadn't shown up. I would have left it there between 11:00am and 1:00pm on Friday. So - I have a few options. 1. Just buy a phone from Solo Mobile (my carrier). This will cost about $100 for a very basic unit. 2. I could cancel with Solo which would cost $260 plus 30 days notice. 2b. I could find my own right fit plan and get a new cell phone for $0 and try to get some sort of fab five plan and still have unlimited talking to Jordan. so... to cancel, or not to cancel? The whole trip was fantastic actually. I had four glorious days in the sun. We lounged, we shopped, we swam, we walked, we explored! It was a good time! Above is a picture of some of the clothes/shoes I picked up. We shopped in outlet stores - so my shoes for example were regularly $120 (naturalizer) and I got them for $30. Most of the deals I found were like that - just rediculous low price for very high quality. You read earlier this week about paying off my Canada Student Loan this April - it's a pretty exciting time. There isn't anything more exciting right now, then the eventual demise of my Alberta Student Loan and becoming debt free. As of May 1, 2010 my remaining debt will be $5,064.01. My regular $75 bi-weekly repayments over the rest of the year total $600 - which will leave me with $4,464.01 remaining. So that little number divided by the 17 pay days I'll have left as of May 1, 2010 is $262.58 bi-weekly. It's hard to beleive, but it's actually possible. I will be 100% debt free in 2010. My recent raise and the prospect of paying off on of my student Loans in April, prompted me to re-evaluate the financial priorties I had established at the beginning of the year. I spent a couple hours talking about it with my mom - and when I asked well how does this look (pointing to an excel spreadsheet) she would say, well what's important? I beleive that I now have some different priorities. we're actually trending to $11,200 and change. This goal will continue to go up in increments until we are at 20% off $300,000 or $60,000. My car will eventually crap out so bad that I need to spend significant $$ on repairs or need to just buy new/used - I have no end goal for this, I just want to start being more prepared for vehicle expenses. Continuing to contribute to my Emergency Fund until I have 3 months of essential expenses saved up. This might be flights to visit my Best Friend in Vancouver, or it could be gas to go camping - but either way I need to start putting money away for this. It's important to the people in my life so it's important to me. 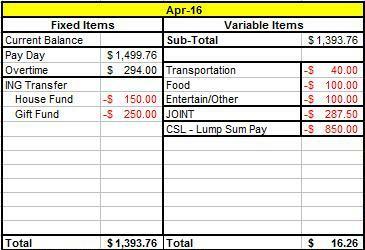 Starting in May, you'll see the above categories represented in my bi-weekly budgets. Not only do I get a raise this month and a third pay cheque. I'll also have 96 hours of overtime paid out. I'm going to make some huge strides towards some of my goals and be able to re-evaulate my current goals. 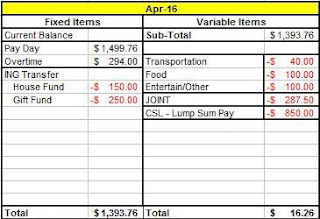 The following bi-weekly budgets (April 16th and April 30th) have some pretty big assumptions about what my new pay will look like and how much my overtime is worth - but I'm hopefully that I've done the math right. They key things to notice are the gift fund categories and the CSL Lump Sum Pay. What the above means, is that come the end of April I will have paid off my Alberta Student Loan and reached my Christmas savings goals!!! That's prety darn incredible if I do say so myself. What does other mean? Well, I'm not really sure. I hope to do a bit of tourist-y stuff...would like to do some shopping - or at least see what shopping is like in the states. We'll see how it goes. 11.32% could mean a lot of things. Would you like to know what it means to me, today? yea. that's right. a big freaking raise. Effective April 3, 2010 my new annual salary will be $53,000 (it's currently $47,000). Whoa! Given that I will join my company's pension plan this October (means automatic 5% deductions and 5% match to retirement savings) - I think I can wait on increasing my retirement savings - but other than that, I'm not sure what to do. My mom suggested put 1/3 bi-weekly into my discretionary spending - to enjoy the fruits of my labour and to put 2/3s towards my student loans. I asked Jordan and he immediately said pay off the debt. I was surprised and said so - b/c he usually says that I save too much. He said that he really wants to see me in a newer/safer vehicle and to do that, we both need to get our debts paid off. He's love for me to spend more (discretionary spending) - but knows that it's unlikely I would put all the money towards it - so he'd rather see me pay the debt off.